The commissioning of the unit is being delayed on account of an ongoing technical review by the AERB and the requirement to comply with the 15 conditions laid down by India’s the Supreme Court. The operator of the Kudankulam Nuclear Power Project (KNPP) said it was not able to give a schedule for the commissioning of the much-delayed first unit, according to a report on the Business Standard. An official with the project’s operator Nuclear Power Corporation of India Ltd (NPCIL) told the paper that the lack of a timeframe is on account of an ongoing technical review by the Atomic Energy Regulatory Board (AERB) and the requirement to comply with the 15 conditions laid down by India’s the Supreme Court in a verdict in May. The paper cited AERB secretary R Bhattacharya as saying that their team was yet to give a final approval for the ‘first approach’ to criticality. 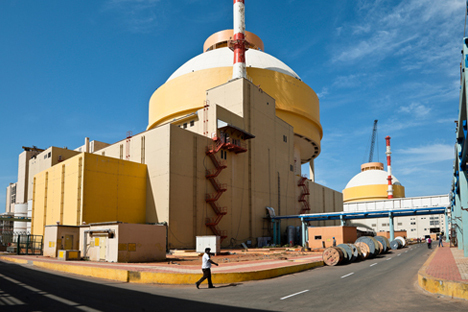 The Kudankulam units comprise of 1000 MW reactors of the VVER-1000 model being constructed by NPCIL and Russia’s Atomstroyexport. The power plant has come under criticism by protestors who demand the scrapping of the project citing the Fukushima nuclear disaster in Japan. Although safety concerns remain over the project, NPCIL and Atomstroyexport maintain that the plant is in full compliance with all safety standards and requirements set forth by the International Atomic Energy Agency after the devastating 2011 earthquake in Japan. India and Russia have ensured that the power station is equipped with the very latest safety systems. The plant is fitted with dual-action localising and protective shells which are able to withstand the impact of an airplane; hydrogen re-combiners prevent explosions from within (which is what occurred at Fukushima); the passive heat extraction system cools the reactor even in the absence of an external power supply, and a device to localise molten material in the active zone — the so-called “melt trap” — prevents the release of radioactivity beyond the unit even in the event of a hypothetical failure of the reactor vessel. In addition, the station will operate a desalination system in full compliance with all requirements. NPCIL has made maximum use of local building and construction organisations in the project. Indian firms now have expertise in the construction of nuclear power plants based on Russian technologies, which means that the next units will be built more quickly.